Phil wrote: Took the trade while price was close to the lower channelline. Perfect IMO A plus. This is what I was trying to convey in my previous post. I've just looked at my charts and whilst my range bar chart needs some work and is not comparable with yours, if your up move does not make it all the way to the top of your channel it would be because the larger time frame is short. When your chart gives a "clear signal" which is also in the same direction as the larger time frame, in this case down, you could watch what happens if you set a TP at the bottom of the channel. Humble wrote: I've just looked at my charts and whilst my range bar chart needs some work and is not comparable with yours, if your up move does not make it all the way to the top of your channel it would be because the larger time frame is short. When your chart gives a "clear signal" which is also in the same direction as the larger time frame, in this case down, you could watch what happens if you set a TP at the bottom of the channel. What Humble said. I'm just looking at the chart, current period, not taking anything else into consideration. I would have to agree trading with the higher time frame in it's direction along with the lower time frame moving in the same would be an A plus trade. Thanks Humble and mr. T, for the comments. 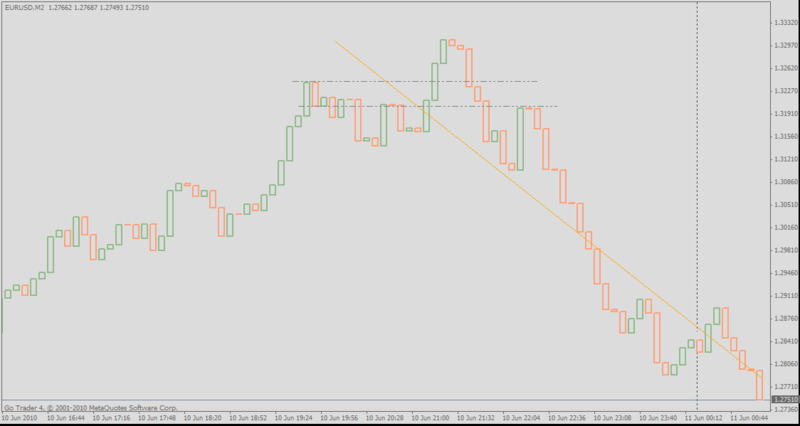 I need to learn to look at the channel direction and trade accordingly, at least keep the direction in mind. I´m kind of an expert of making things too difficult and sometimes i want to trade soo badly i loose my sight. thanks for the trailing stop indi. can u explain breifly how to use it? is it an indi or an ea? It´s an ea. Just drag it on the chart, no range chart, and set it´s properties. The stop is enabled when the price is greater than the openingsprice + trailingpip amount set in case of an long position. So when you buy at 1.2000 and the price is 1.2018 and you´ve applied a trailing stop of 5 pips, this means the trailing stop is at 1.2013. When price is going down you get 13 pips. Just make sure you enable the ea and allow dll import and have it running.